Equity investments offer multiple opportunities for capital growth and high returns. Read on to know why your investment portfolio should invest in equities and equity-related instruments. Investing in equity mutual funds can be a tricky scenario - not just for beginners, but seasoned investors and experienced fund managers as well. While accredited investors and professional Asset Management Companies (AMCs) have the technical knowhow to make smart investment decisions, navigating risky capital market conditions and unpredictable inflationary situations. But, wait! There’s no cause for concern. There are a host of equity mutual funds available across market caps and industries that are designed to cater to varied investment objectives and risk appetites of investors. So, what exactly do you need to get started? Research well and coordinate with a professional AMC, if needed, to invest in the best growth and dividend-paying mutual fund. Let’s have a look at the benefits of investing in equity mutual funds in the FY 2018-19. When we’re discussing the advantages of equity mutual fund investments, we simply cannot miss talking about its primary benefit of generating capital gains. When equities of a company that an investor has invested in experiences capital growth, the profits are reinvested in the equities of the same company to generate greater returns. This is especially beneficial for small and medium sized companies that are jostling to stay afloat in the highly competitive marketplace. The additional capital gains can then be fruitfully diversified by the company for product development, business expansion and other marketing strategies. The business growth represents the increasing value of the company, which in turn, fuels the rise of the company equity value. This is also a relevant form of returns for people not looking for exponential growth. For giving such returns, companies pass on a certain share of the profits to the shareholders as dividend, as opposed to reinvesting the entire capital gains back into company equities. It is often recommended that investors looking for a steady and reliable source of income invest in the stocks of blue chip companies. This is because these companies are known for offering dividends to their shareholders every quarter of a financial year, irrespective of the prevalent capital market scenario. Hence, it is a smart investment strategy for you to maintain a portfolio of multiple stocks of blue chip companies that pay dividends at different cycles of a financial quarter. That way, you can enjoy a steady dividend income every month. Some companies also offer capital gains as a combination of assets and income in the form of dividends. Unlike real estate where your capital remains blocked till it can guarantee a healthy return on investment, stocks or equities are a more liquid investment option. They are traded on major exchanges worldwide and across time zones. This implies that you can sell the stocks in your portfolio whenever you want. You may not enjoy as much liquidity as cash, but you will be able to get the money from your stock transaction generally within a day or two. 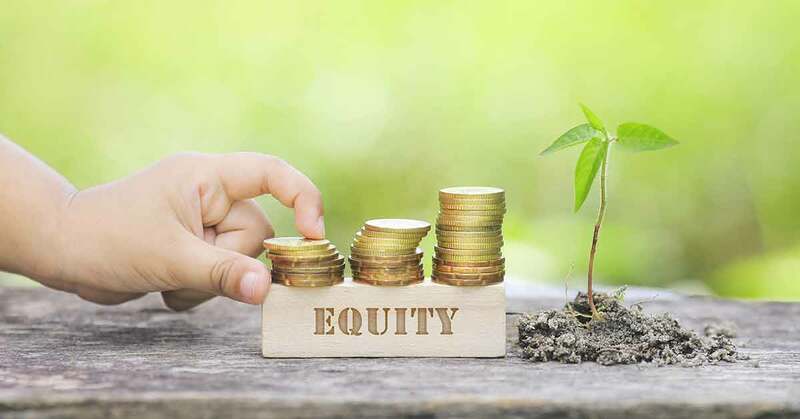 When you invest in equity funds of a company, you hold the ownership of the company to the extent of the number of equity mutual fund units you have purchased. You share the profits made by the company. Similarly, you also share the consequences when the company stocks run into a loss. As a shareholder, you share the results of the company’s performance in the equity market. As discussed in the last pointer, the liability of the investor is restricted to the number of equity stock units he/she has purchased. Hence, a shareholder is liable to share the profit or loss only to the extent of the capital invested by him/her in the company. When a company looks out for accumulating capital for business expansion, product development, etc., it issues rights shares. How does this help shareholders? These shares are issued at a lower price as compared to the prevailing market price of the company’s stocks. The existing shareholders enjoy precedence over other investors. The existing shareholders can seize the advantage of purchasing the shares at a cheaper rate. As the word ‘split’ implies, a share is divided into parts, which reduces the market price per share and increases their demand among other investors. This, in turn, raises the quantity of the shares. Bonus shares, as and when issued by a company, often serve as a substitute for dividends for the existing shareholders. These are offered free of cost. Equities and Equity mutual funds are a versatile investment option, provide you select them as per your unique investment objectives, risk appetite and market cap. Research thoroughly, take your pick and…Get, Set, GO!